It is important to understand the simple math behind early retirement. Your savings rate, and asset returns will determine how long it takes for you to retire. Minimizing taxes and investment costs results in more money compounding for you. If you save 70% of your income, invest in dividend paying companies yielding 3% and growing earnings, dividends and share prices by 4% per year, you will be able to retire in approximately 10 – 11 years. If you only save 50% of income, you will be able to retire in 17 - 18 years. At a 40% savings rate, it takes 21 - 22 years to reach the dividend crossover point. If you only manage to save 30% per year, you will be able to retire in 27 - 28 years. 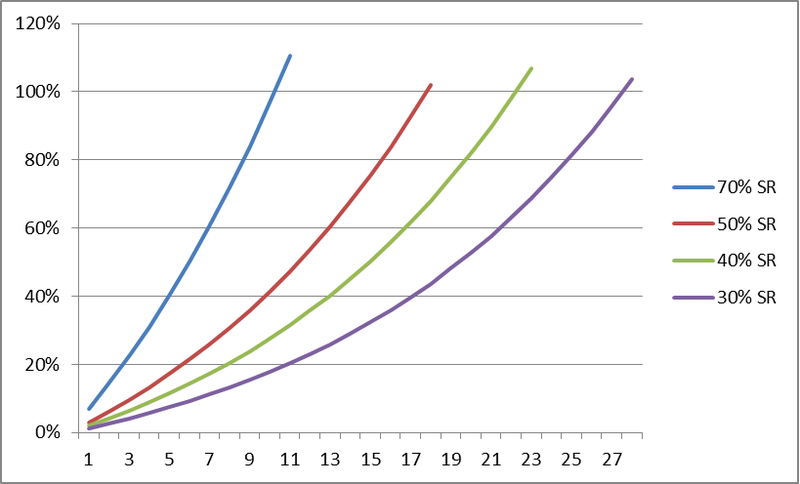 This chart shows how long it would take for the investment income to exceed the amount of savings, given the return, the dividend growth, dividend reinvestment and savings assumptions. You can view the spreadsheet behind the calculations from this link. You can download it, and play with your own assumptions. I assume a “real salary” that does merely keep up with inflation, and investment returns that are also “real” and therefore are after inflation. I also am ignoring the effect of taxes on investment income, since everyone’s taxes are different, and I didn’t want to complicate too much this simple truth. More complications are probably going to confuse people, rather than make it clear for them. I am also assuming that this investment income is the only income to provide the essentials for a basic retirement income. In most situations, a person would have pension income and social security income or even some part time job income to rely upon, when they retire. For those who strive to retire early, it is quite possible that they will exclusively rely on the income produced from their investments. This post was inspired by this article from the Mr Money Mustache blog. What this exercise shows you is that you need to focus on things within your control, in order to reach your goals. We have no control over stock market returns, or expected dividend growth rates. However, we can somewhat control our savings rate, and the investments we make. Starting out as early as possible helps tremendously too. I started out in my early 20s, and am pretty close to being financially independent by my early 30s.